My main interests have been in making optical measurements on wide-bandgap semiconductors and low-dimensional systems such as quantum dots, wires and wells. Topics currently being investigated include the generation of single photons in the blue, coupling of quantum dot emission at telecom wavelengths to photonic crystals, coupling of various quantum emitters to discrete cavities. 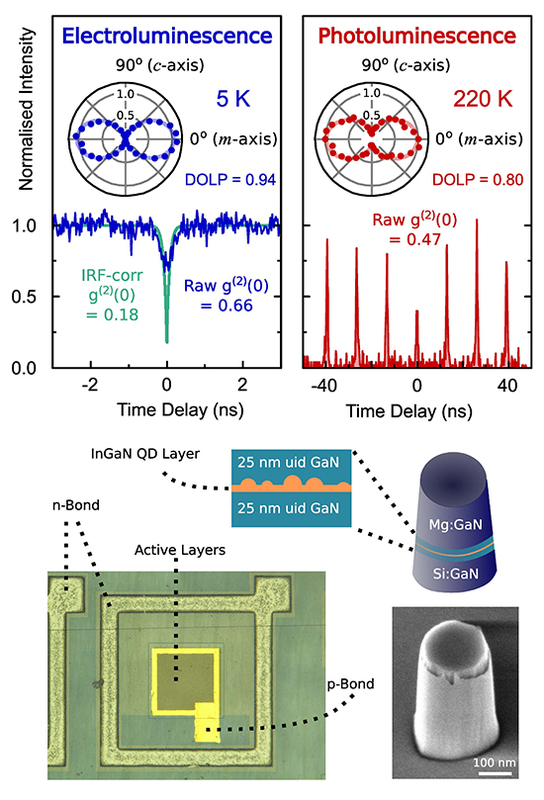 Past work focussed on coherent electron-hole dynamics, excitonic dynamics in wide band gap materials such as GaN and InGaN, and gain mechanisms in bulk and quantum well lasers. Please have a look at my publication list for references to relevant recent work. Our work on nitride quantum dots, discussed in more detail below, has just been showcased on the Science and Engineering South website here. Until December 2009 is was part of the Quantum Information Processing IRC (QIPIRC), directed by Prof. Andrew Briggs at the Department of Materials in Oxford. I was looking at InGaN quantum dots, studying dephasing, carrier lifetime and inter-dot interactions. For more details see the project website at www.qipirc.org. I also work on dots made from InGaAs, which emits in the infrared. 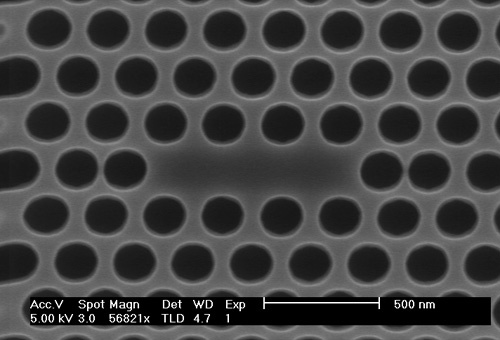 These dots are registered optically and then placed in cavities formed by using photonic bandgap structures, also as part of the IRC in quantum information processing. I was awarded a grant as part of the Materials World network in May 2010 jointly with Dr. Rachel Oliver at the Department of Materials, Cambridge University and Prof. Evelyn Hu at the School of Engineering and Applied Sciences, Harvard University. The title of the project is "Materials World Network to Optimize the Growth of InGaN Quantum Dots within High Quality Optical Micro-Cavities". A summary of the project can be found here at the EPSRC website. In April 2013 I started work on a new project in collaboration with Dr. Fred Brossard at Hitachi Cambridge Labortories and Prof. Ray Murray at Imperial College, London. The title of the project is "Long wavelength single photon sources and dotonic molecules". A summary of the project can be found here at the EPSRC website. My current grant on non-polar InGaN quantum dots for single photon applications by EPSRC commenced in late February 2015. This is in collaboration with Dr. Rachel Oliver in the Materials Department in Cambridge. A summary of the project can be found here at the EPSRC website. Quantum dots are small nanometre sized inclusions of a lower bandgap material in a solid matrix of higher bandgap. These materials, when excited optically, show evidence of the "quantum confinement" of electrons and holes in the dot material. There is currently much activity in the field of quantum dots as there are many potential applications in optoelectronic devices and other novel applications. One such application is quantum computation. In this field, quantum dots are a useful playground for investigation, as it is possible to grow arrays of quantum dots in vertical stacks with well defined separations. This is important, as one of the most important aspects of any quantum logic device will be the ability to control the interactions between separate qubits. The variation in spacing between dots will change their interaction strength. However, in order to build a quantum computer there are many practical difficulties to overcome. The figure above shows a scanning eletron microscope image of a coupled photonic crystal waveguide cavity with embedded InGaAs quantum dots. The shifted holes produce a reduction in the local potential producing two coupled optical wells as shown in the schematic energy diagram below the imnage. At the bottom a finite difference time domain calculation of the expected electric field pattern is seen, together with a simulation of the luminescence intensity expected from a single cavity and from the coupled cavity. The graph on the top right shows the experiemtnallly measured emission from the cavity structure in the SEM image, showing excellent agreement to the simulation. The exciton binding energy is high (25meV) so that excitons are stable up to room temperature. Quantum dots in the nitride system have piezo-electric fields such that the dots levels can be shifted to both higher and lower energies under the influence of an applied electric field. 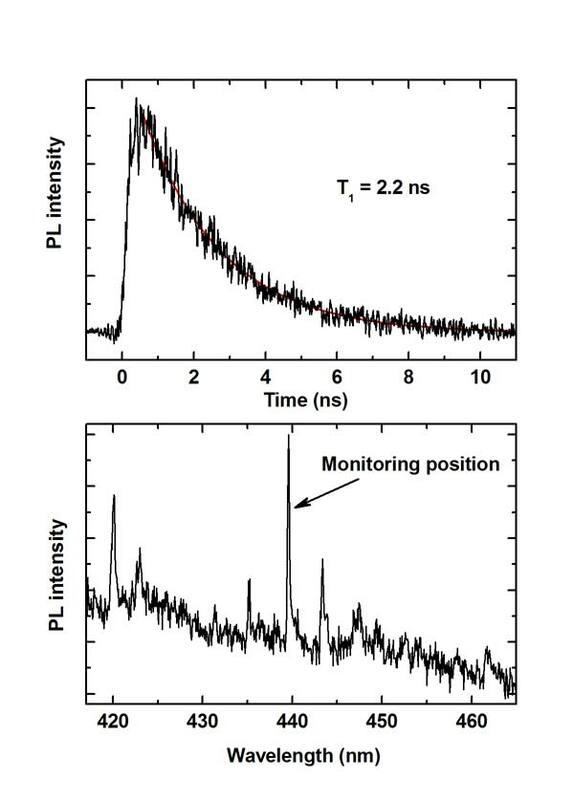 The LO phonon energy is also high (92meV), which suggests that the quantum dots may be more decoupled from the thermal environment than in other systems. 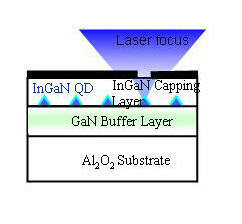 We have been successful in producing single photons from a-plane InGaN quantum dots both pumped optically and electrically. We have also shown that these a-plane dots are a source of polarised photons, with a high degree of polarisation. We have published several papers on these dots recently, and most of these are available on open access. Please see my publications section on this website. Prof. Robert Taylor - has a great deal of experience in optical measurements of III-V semiconductors including GaAs, GaN and related materials. 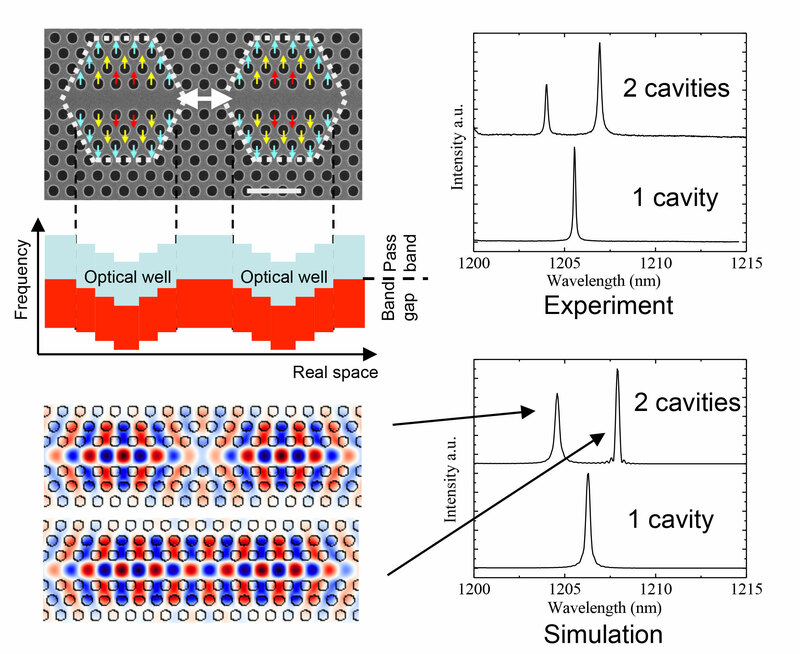 Past research has included work on ultrafast carrier relaxation, gain mechanisms, plasma effects and the Mott transition in both bulk and quantum well materials. Current interests revolve around microphotoluminescence spectroscopy of quantum dots in the arsenide and nitride systems, and in the optical properties of single carbon nanotubes. Dr. Rachel Oliver is a Reader in Materials Science at The Department of Materials in Cambridge, working on the development and growth of InGaN quantum dots and other nitride based materials. Dr. Tim Puchtler is a postdoctoral researcher working on InGaN non-polar quatum dots. Luke Nuttall is a fourth year CASE award student working on the InAs project. Stephen Lennon is a third year graduate student working on the InAs project. Tong Wang is a third year student working on the InGaN quantum dot project. Claudius Kocher is a second year graduate student working on the InGaN quantum dot project. Guanhua Ying is a first year graduate student working on single molecule emission and diffusion in pervskite solar cell materials. A time-correlated single photon counting system. A high resolution spectrometer for single dot spectroscopy. Fig. 1: A schematic of our sample and a method to isolate single dots for optical measurements. An Aluminium mask is deposited, then windows as small as 100nm x 100nm are etched away, leaving some holes that contain a single dot. 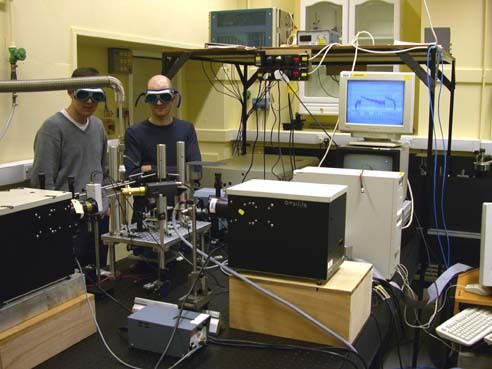 Fig.2 This is a photograph of the micro-PL system that we have set up in order to look at the time- and spectrally-resolved emission from a single quantum dot.